Last night was my first full-length City of Langley Council meeting. 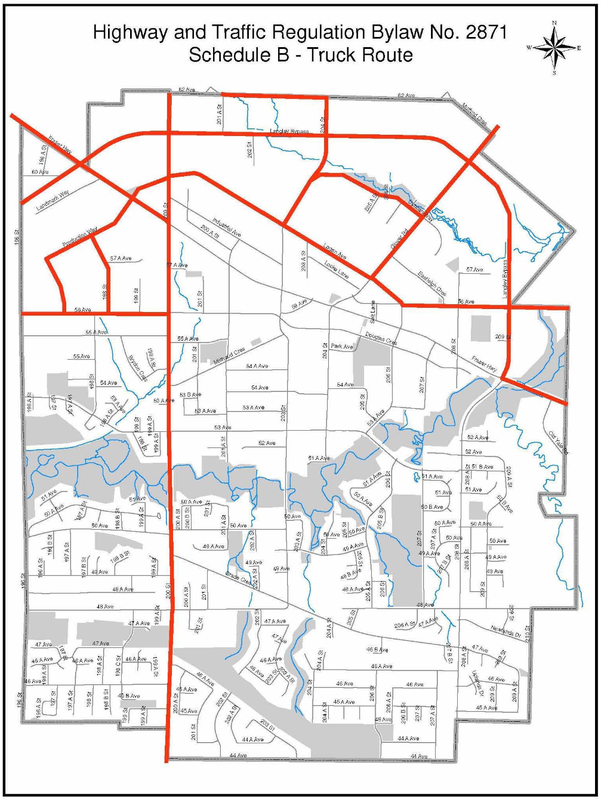 City Council heard around half-a-dozen presentations, and gave first, second, and third reading to a bylaw to amend the truck routes in the community. Council heard from RCMP Superintendent Murray Power as he gave his quarterly report about the Langley Detachment. 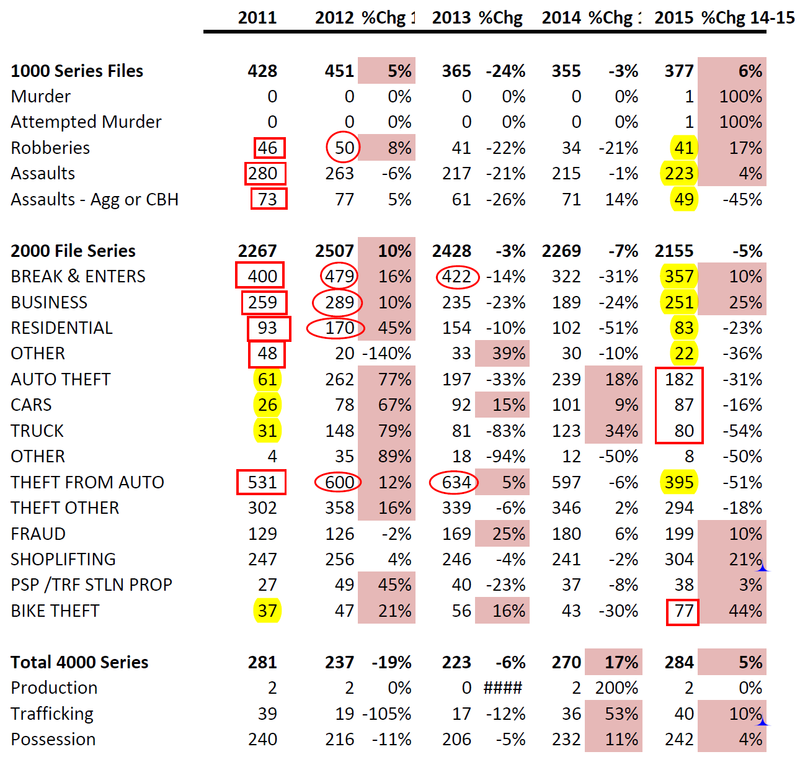 He shared the following 5-year chart to show that reported crime is on the decline in Langley City. 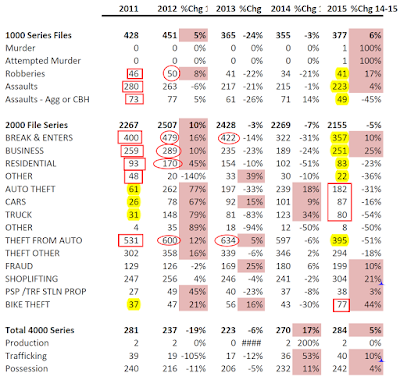 5-year chart of crime statistics for Langley City. Select table to enlarge. The only area where there is an significant increase in crime is around auto and bike theft. Superintendent Power noted that this is an issue throughout the region, and that it is caused by a relatively small group of people. He said that once these people are removed from the street, these numbers should drop. Both shoplifting and drug related crimes are up. Superintendent Power said that this has more to do with more crime being reported than an actual increase in these specific categories of crime. Power said that Langley City streets are safe. To prove that point, he noted that 2/3rds of assaults are caused by people a victim knows. Power also said that Langley RCMP are walking the beat in the City of Langley. To me, this improves the perception of safety in the community. Next, Langley City Council heard from Fire Chief Rory Thompson. Thompson said that there has been a 17% increase in the volume of calls over the last five years, and that Langley City fire crews are among the busiest in the region. Reading between the lines, it appears that Langley City Council may need to have a conversation around the staffing level at the Fire Hall. One of the disturbing trends that Thompson noted was the amount of overdose calls that the Fire Services responds too. He said that it was due to street drugs being laced with fentanyl. Medical calls have spiked from 78% of all calls, to 81% of all calls. More specifically, there were 6 overdose call responded to in January 2015, and 31 this January. Fire Chief Thompson noted that BC Ambulance normal arrives 3 minutes after Fire Services arrives on scene. Three of the fires were due to drug related activity. Unsafe drug use in Langley City is become a major public health and safety issue. After the quarterly reports, the Mayor invited Councillor Storteboom and Martin to give their regular updates. After those updates, Council heard from Director of Engineering, Parks & Environment Rick Bomhof. Community gardens are popular in Langley City, and Bomhof noted that the garden in Linwood Park has been expanded. He also noted that the waterline under Salt Lane in Downtown Langley is being replaced. Once the underground work is done, Salt Lane will be paved. The sidewalk and roadway will remain level, and a new “Salt Lane” sign will be installed. Next, Director of Recreation, Culture & Community Services Kim Hilton outlined all the events that are taking place in the community. You can find out more information about the events on the City of Langley's website. 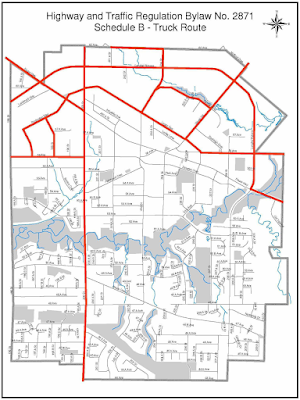 Proposed Langley City truck routes in red. Select map to enlarge. The final piece of Council business was to appoint me as one of the vice-chairs of the Parks, Environment, Recreation and Culture Advisory Committee. I previously served on this committee as a member-at-large.